easy Archives - Page 39 of 41 - What the Forks for Dinner? Sometimes in life you meet someone, who through unforeseen circumstances, life throws a curve ball. I know a young woman at school who is having such an experience. Angela is the daughter of one of my staff at school, she is in her Senior year of High School and has been ill for much of that time. She has gone through a lot this year and has managed to do so with grace and a sense of humor, that I am not sure I would have had at her age…….she is beautiful inside and out. Although she is getting better, she has learned that a gluten free diet may help. As anyone who is trying gluten free knows substitutes, especially for sweets can be a challenge. I talk about my blog at work, and my staff has listened to me go on and on about whatever it is that I am doing for my blog. They have been my guinea pigs, official taste testers, and sounding boards. I was talking about a request from a friend of mine for gluten free recipes and Angela made a comment that she had tried gluten free brownies and they were awful. 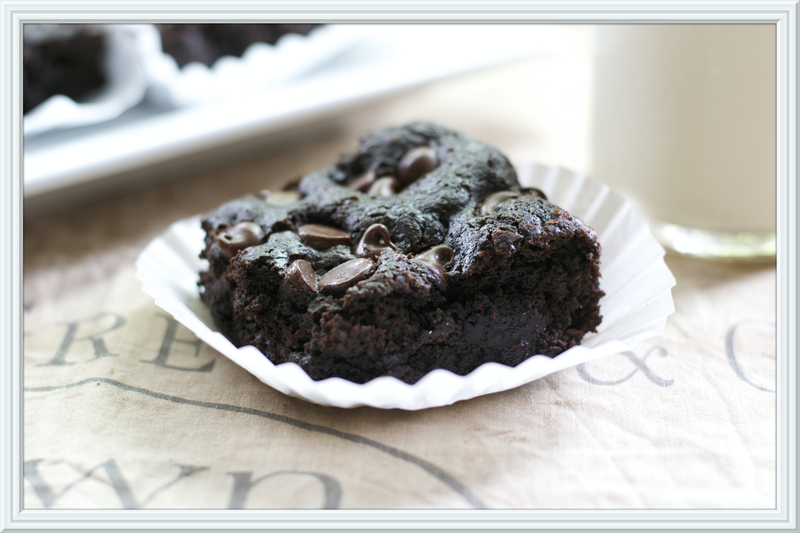 Perusing Pinterest one day, I came across a recipe for a gluten free brownie using of all things, black beans. The original recipe is from Skinnytaste, a food blog that I follow. I wondered if they would taste like a real brownie and how they would turn out. With Angela in mind I made them. Now, I must admit I was a little scared to taste them, as I have never had much luck with substitutions in baking. I was sooooo very surprised! They were gooey, chocolatey, fudgy, and quite frankly, I don’t know anyone who would be able to tell that they were not regular brownies. But the real test would be having Angela taste them. Now, I am sure that she was just as leery as I was to eat them, but she did and the look on her face was priceless. She loved them!!! They are so good you may have to hide them……….. Blend the black beans, eggs, cocoa powder, sugar, oil, almond milk, balsamic, baking soda, baking powder and coffee in the blender until smooth and pour into a bowl. Fold in 1/2 cup chocolate chips until combined. Pour the brownie batter into the prepared pan. 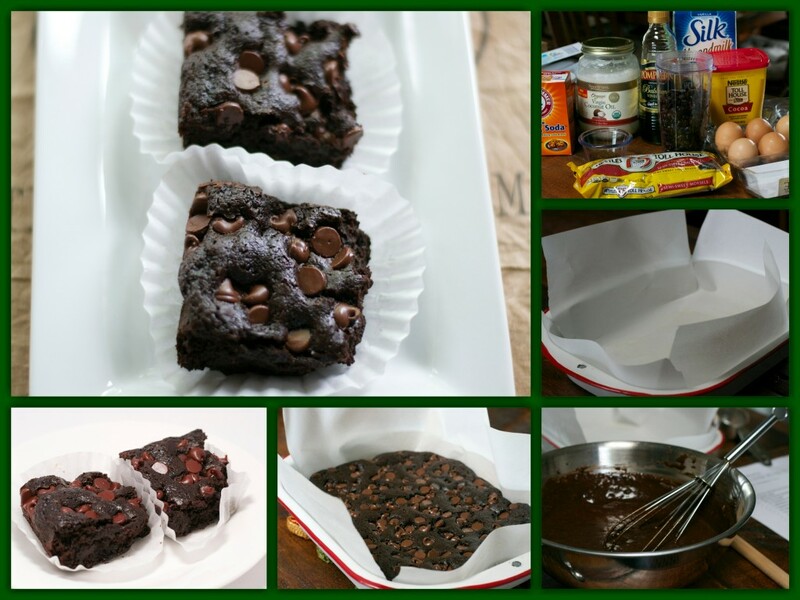 Sprinkle the remaining chocolate chips evenly over the top of the brownies. 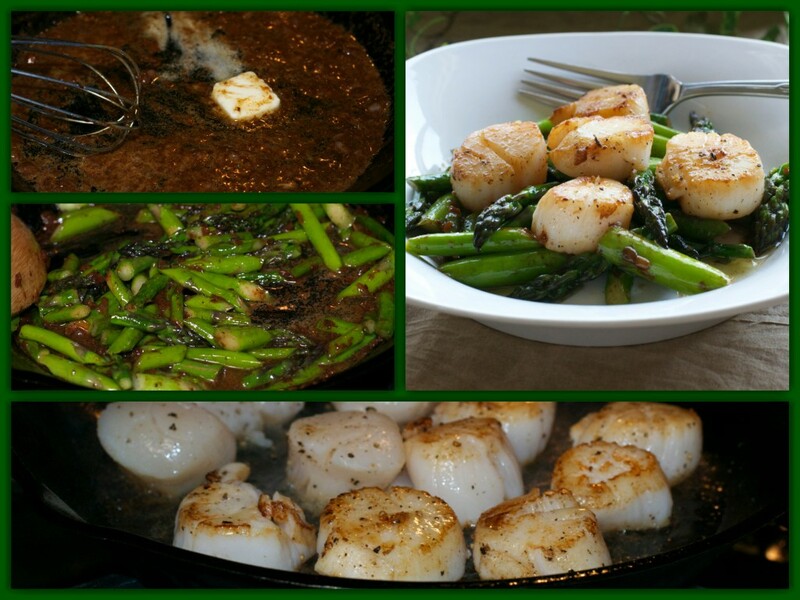 Asparagus Scallops ……….Asparagus……..our first year with our own has proven to be well worth the wait………it has taken three long years. We have made several dishes, and as the crop continues (hopefully for a while longer), I will be able to post a few more recipes with this yummy spring veggie. Scallops, are something that people either LOVE or do not. Tim and I happen to LOVE them. They pair well with many things but, pairing them with the fresh, home grown, extra special, because we grew it ourselves asparagus, was nothing short of fabulous! While the sauce is not exactly fat free it is tastiful……………I know not proper english, and probably grammatically incorrect, but…………….if you want that kind of writing you are in the wrong spot. I write like I talk……..those of you who know me know I am kinda a goober sometimes, so, now those who do not know me know as well. This recipe is quick to fix, would be impressive to serve to company, makes a great date night dinner, and as I have already said is tastiful!! So. 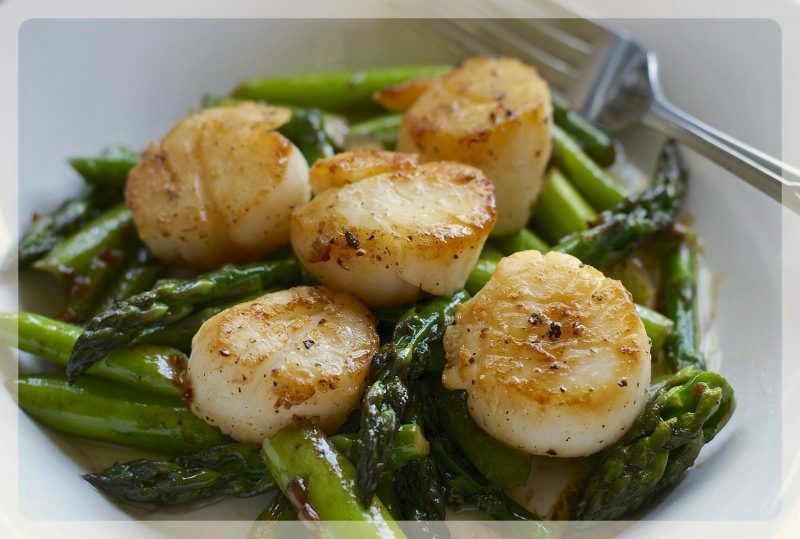 whether you have your own asparagus, bum some from a friend who has an asparagus patch, or purchase it from the store……………then try our Asparagus Scallops recipe for dinner tonight! Trim asparagus, then cut stems into 1/4-inch-thick diagonal slices, leaving tips whole. Heat 1/2 tablespoon oil in a 12-inch heavy nonstick skillet over moderately high heat until hot, sauté asparagus, stirring occasionally, until just tender, 5 to 6 minutes. Transfer to a plate with a slotted spoon, reserving skillet off heat. You can use the same skillet for the entire meal, so no need to clean. 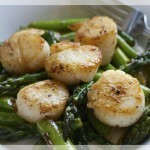 Pat scallops dry and sprinkle with salt and pepper. Add remaining oil to skillet and heat over moderately high heat until hot, then sauté scallops, turning over once, until browned and just cooked through, 4 to 6 minutes total. Transfer scallops to another plate as cooked. Add white wine and vinegar to skillet and bring to a boil, scraping up any brown bits in the pan. Boil until liquid is reduced to about 2 tablespoons. Add any scallop juices accumulated on plate and bring to a simmer. Reduce heat to low and whisk in butter, 1 tablespoon at a time, until incorporated. Add asparagus and remaining 1/4 teaspoon salt and cook until heated through, about 1 minute. Easter Sunday………Families, faith, and of course food! Every Easter, all the Aunts, Uncles, and cousins would squeeze into my Grandma’s tiny little house for a huge Easter feast at the center of which was my Grandma’s ham. It was always huge, you know so she could send some home with everyone. She saved margarine and cool whip tubs all year so she could send left over holiday food home. Back then the take home was for ham sandwiches or scalloped potatoes and ham. 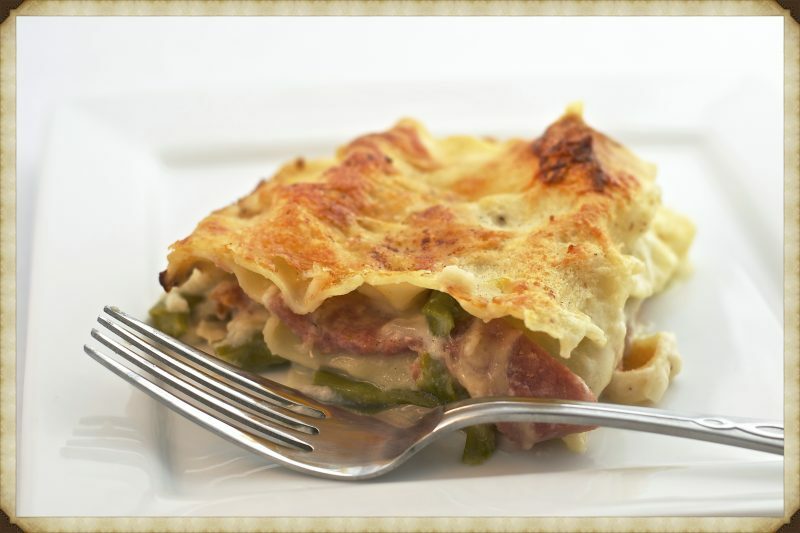 So in tribute to the left over ham……..Asparagus Ham Lasagna.When you buy a ham,buy a bone-in ham. 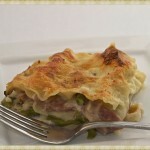 You can use the left over ham for sandwiches, scalloped potatoes and ham, or Asparagus Ham Lasagna! The bone makes a nice pot of October Beans Southern Style. 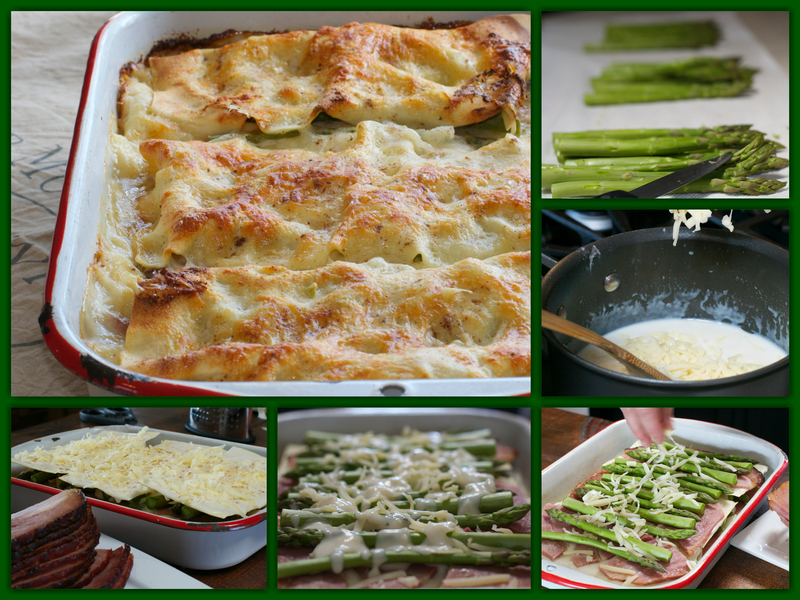 Since spring and Easter go hand and hand, and asparagus is associated with spring, and Easter is associated with ham………not sure where I was going with that but…..the combination of asparagus, ham, and swiss cheese is delicious!!! Adding pasta is like icing on a cake. The nice thing about lasagna is that you can make it and bake it, you can make it and bake it the next day, or you can make it and freeze it for a meal when you don’t know what to fix. Add some crusty bread and a nice green salad and its a feast that is sure to please. In a medium saucepan, melt the butter over medium heat. Add the onion and garlic, cook, stirring occasionally, until softened, about 5 minutes. Stir in the flour and cook for 2 minutes. Slowly whisk in the milk and bring to a boil over medium-high heat. Lower the heat and simmer, whisking constantly, until thickened, 1 to 2 minutes. Remove from the heat and stir in 1 cup of swiss cheese and half of the nutmeg; season with salt and pepper. Spread about 1/3 cup of the cheese sauce in a baking dish. Layer 3 noodles on the sauce and top with 3/4 cup cheese sauce. Place half the ham and asparagus on top and 1/3 of the remaining swiss over the sauce. Repeat the layering process three more times. Top with the remaining noodles, cheese sauce, swiss and nutmeg. Cover with foil and bake until heated through, about 30 minutes. Uncover and cook for 10 minutes more. Let stand for 15 minutes before serving.